A rational expression is a quotient of two polynomials. The denominator of a rational expression must be nonzero, as division by zero is undefined. To find the values for which a rational expression is undefined, we set the denominator equal to 0 and solve the resulting equation. These solutions are the values for which the expression is undefined. The expression is undefined for x=3,6. To simplify a rational expression to lowest terms, we first factor the numerator and denominator. Then we may divide out common factors in the numerator and denominator. 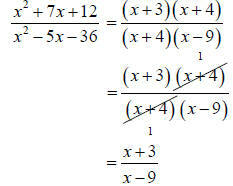 simplifies to equal -1,as any fraction whose numerator is the opposite of its denominator is equal to -1. 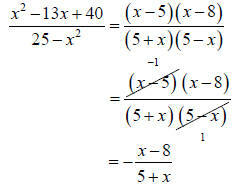 To multiply two rational expressions, factor each numerator and denominator completely. 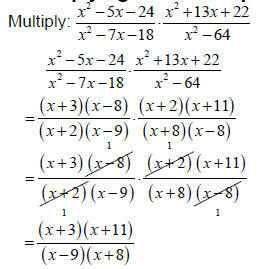 Divide out factors that are common to a numerator and a denominator and multiply the remaining factors, leaving the numerator and denominator in factored form. 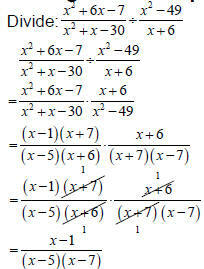 To divide a rational expression by another rational expression, replace the divisor by its reciprocal and then multiply.